Bones, which are the primary load bearing structures of the body, are hierarchically organized biocomposites composed of a ceramic phase (calcium hydroxyapatite, HAP), protein phase (mostly type-I collagen) and water. These 3 phases create the basic building block of bones: the mineralized collagen fibril. Collagen, a triple helical protein, self-organizes into bundles called fibrils. These fibrils are well organized and contain regularly spaced regions of high and low protein density called the overlap and gap zones respectively. The HAP crystals are believed to then grow within these gap zones reinforcing the weak collagen structure. The fibrils are further organized into higher level structures like the lamellae and osteons, and are arranged according to the structural need of the organism. It is due to this multi-level composite structure that bones are able to have both high strength and toughness. Most of the works on the mechanical properties of bones have focused on the macroscopic behavior. An understanding of the mechanisms operative at the lower levels of hierarchy is still incomplete. In order to determine the role and importance of the HAP crystallites and the protein, I use high energy x-ray diffraction to determine inter-phase load transfer and mechanical behavior under different types of loading. I use the X-ray diffraction facility at the Advanced Photon Source, beamline 1ID-C for most of my experiments. During the experiments, a high energy monochromatic x-ray beam is sent through the sample. As it travels through the bone specimen, the x-rays interact with regularly spaced planes and are diffracted at specific diffraction angles producing corresponding diffraction rings. The angle at which the x-rays are diffracted provides information about the spacing between the diffracting planes. By looking at large angles (wide angle x-ray scattering, WAXS), small spacing such as the lattice spacing within the HAP crystals can be measured. Similarly, by examining x-rays diffracted at small angles (small angle x-ray scattering, SAXS), large spacing such as the spacing between HAP crystals in the gaps zones can be measured. This gives the fibrillar strain information. The interesting part of the experiment is that it can be carried out in situ under various loading and environmental conditions. Using the d-spacing from two different structural scales, I am able to determine the strains on the mineral and the organic phase independently and simultaneously under various external conditions, and thus understand the load transfer between them. I can then correlate the properties at the smaller scale, determined via X-rays to the macroscopic behavior of bone. Most of my experiments on bone have been done under compressive loading conditions. Since bone samples are very variable from one location to the other, I have addressed the variation of load transfer within a single cross-section of the femur, by measuring the apparent modulus which is simply the ratio of the applied stress on the sample to the phase i.e. HAP or fibril strain. I have also performed mechanical tests addressing the effect of variable external temperature, where I have found that the apparent modulus is not significantly different between room (27°C) and body temperature (37°C). 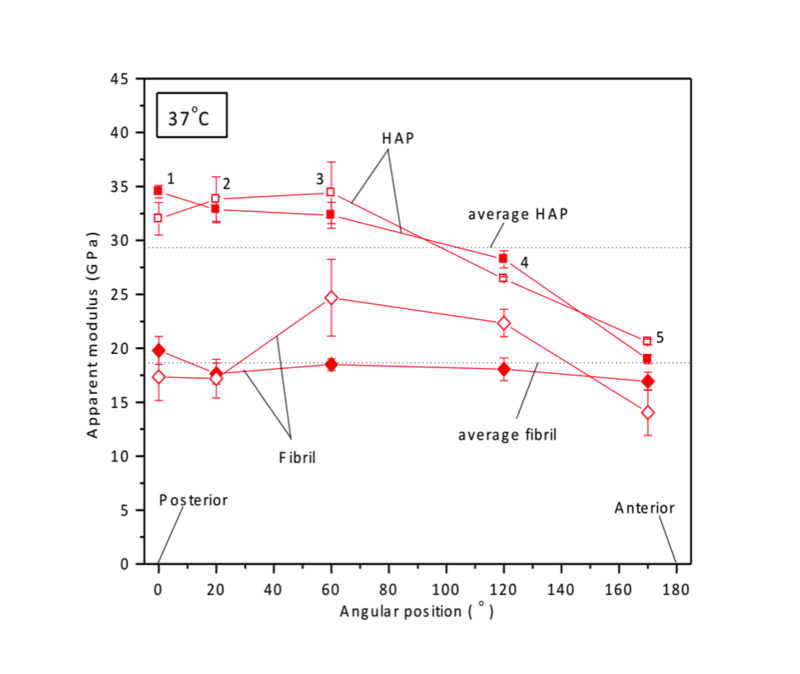 In collaboration with Ms. Alix Deymier-Black and Mr. Fang Yuan, I have shown that the creep behavior of bone is significantly different at room and body temperature. Tests have also been performed investigating the load transfer behavior under fatigue loading conditions, which is the most common physiological form of loading. Additionally, I have performed simple loading experiments on bone samples with an embedded implant, mapping the strains near the bone-implant interface and far from it. Recently, changing gears, I have also performed tensile loading tests on bones at body temperature, addressing the variability between samples. With this increased knowledge about structure-property relationships in bone, there will be greater scope for improved bone restoration, treatment of diseases like osteoporosis and design of implants whose properties match those of natural bone more closely. 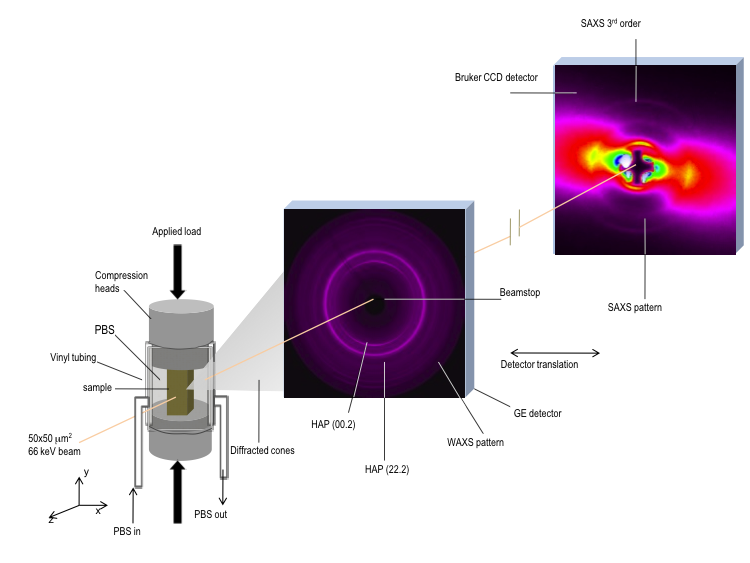 FIGURE 1: Schematic of the set up at the Advanced Photon Source, beamline 1ID-C. The WAXS and SAXS patterns are examples of typical diffraction patterns from bone. FIGURE 2: Graph showing the variation of the HAP and fibrillar apparent moduli across a femur section from the posterior to the anterior end. This research is funded by .